In this article I explore the 'Action' of the 'Principle of least Action'. I discuss how the Principle of Least Action relates to the laws of motion. The Action involves kinetic energy and potential energy. There is another physics law that is stated in terms of kinetic energy and potential energy: the Work-Energy Theorem. I will discuss how the principle of least Action relates to the work-energy theorem. I will follow the standard notation of using the letter S for the 'Action', and denoting kinetic energy with 'T' and potential energy with 'V'. We have that when the Action is evaluated for a range of trajectories the value of S is least for the case of the true trajectory. How is it that the quantity (T-V) has that property? Instead of subtracting V from T early on I will evaluate the time integrals of T and V separately. In notation: action components ST and SV. I will present the principle of least action in terms of differences between ST and SV. An object shoots upward, released to free motion. The object climbs, decelerated by gravity, reaches its highest point, and falls back again. - Mass of the object: 1 unit of mass. Those conditions imply that along the true worldline the starting velocity is 2 m/s, and the object climbs to a height of 1 meter. Diagram 1 gives the height (vertical axis) of the object as a function of time (horizontal axis). The graph representing the motion is of course a parabola. Expression (4) gives that parabola. Graphlet 2 shows how the worldline is varied, generating a class of trial worldlines. The startpoint and endpoint are fixed, in between the wordline is varied. The set of all possible variations of the worldline is much larger than this particular class of course, but for the purpose of this demonstration this simplest case is sufficient. In the graphlet, use the slider to see the range of trial worldlines. As you can see, when variational parameter pv is zero expression (5) simplifies to expression (4). To prepare the ground for comparing kinetic and potential energy graphlet 3 shows a trivial case: how the evaluation comes out if there is no force (and therefore no potential energy). Then in the graph the true worldline is a straight line. The diagram on the left shows a range of trial worldlines, the diagram on the right represents the kinetic energy at each point in time. The shaded area underneath the red line is a measure of the integral of kinetic energy over time. Trivially, for the straight wordline that area is the smallest. Graphlet 4 depicts the case where a downwards force is present. With a force there is a potential. On the left once more the motion of the object. The red line represents the kinetic energy along each respective trial worldline. The green line relates to the potential energy. The green line represents minus the potential energy. Graphically the graph of the potential energy has been flipped down. I flipped the graph of the potential energy down to enable comparison. The object is moving and changing velocity; there is continuous interconversion of kinetic energy and potential energy. So: at every point in time the rate of change of kinetic energy matches the rate of change of potential energy. In other words, in the case of the true worldline the graphs of the kinetic energy and minus potential energy are parallel to each other at every point in time. The number in the rectangular box is the value of the Action: the integral of the kinetic energy minus the potential energy. 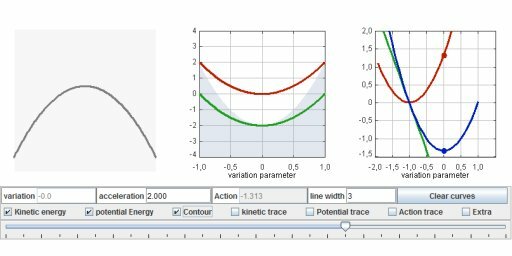 Expression (5) gives the worldlines as a function of time t and the variational parameter pv. The derivative of function (5) with respect to time gives the velocity. Note that the kinetic energy is proportional to the square of pv and that the potential energy is a linear function of pv. That means their sensitivity to changes of pv is different. The Action is an integral. That is, the evaluation of the worldline as a whole is condensed to a single number: the outcome of the integration. On the other hand, what we want to verify is that graphs of kinetic and minus potential energy are parallel at every point in time. How can the outcome of the integration tell us that? Consider expressions (9) and (10), both are integration from t=-1 to t=1, in notation ∫-11f(t)dt. What if you would cut that up, and compute two adjoining integrals, ∫-10, and ∫01? The following property is so important that I'm putting it in a box section. When ∫-11f(t)dt is minimal then both ∫-10f(t)dt and ∫01f(t)dt are minimal. The above statement is specific, but clearly it generalizes to all cases. The integration to find an Action is over a certain timeframe, we can call that: from t1 to t2. You can subdivide that timeframe in subsections. The overall integration will be minimal if and only if the integrals of each of the subsections are minimal. And there is no limit to how far you can subdivide, so it extends to infinitisimally short subsections. For now I integrate T and V separately. The following integrals are from t=-1 to t=1. As announced earlier I use the notation ST for the 'Kinetic energy component of the Action', and SV for the 'Potential energy component of the Action'. The red line is the graph of ST. The red dot gives the value of ST that corresponds to the trial worldline on the left. The green line graphs the negative of SV (just as in graphlet 4 the green line is the negative of the potential energy). The blue line graphs the Action as a function of pv. Expressions (7) and (8) are functions of the variational parameter pv and time t. Having performed the integration over time expressions (9) and (10) are functions of just pv. The graph of the Action as a function of pv is a parabola. The minimum of the parabola is the point where its derivative is zero. Expression (11) gives the condition that is satisfied when the blue line, the graph of the action, is at its minimum. Expression (12) shows that the Action is minimal when pv is zero. This completes the demonstration that the work-energy theorem implies the principle of least action. Downsized screenshot of the supporting Java applet. The applet controls include a slider to vary the worldline. The acceleration is adjustable (Main purpose: to cover the case of zero acceleration.) The applet computes the curves numerically and analytically. The numerical computation is on the fly. As you move the slider the applet computes the action for the current position of the slider; the dot moves in accordance, and the applet traces the dots, so gradually curves build up. What I hope is that you will download EJS, that you will download and open the applet source file, and that you will examine the expressions for yourself. That is the applet's purpose. In the discussion above I used an acceleration of 2 units. Here is a version with the acceleration unspecified; it is represented with the symbol 'a'. As before the duration is set from t=-1 to t=1. The worldline is varied, generating a class of trial worldlines. The time integrals of the kinetic energy and the potential energy respectively. For the Principle of Least Action the case of harmonic oscillation is particularly interesting. As we know, when the restoring force is proportional to the distance r to the origin the solution to the equation of motion is a sine function. The derivative of the sine function is the cosine function. That is, taking the derivative results in the same function that you started with, only phase shifted. This shows in what way harmonic oscillation is a unique case: both the kinetic and the potential energy are the square of a sine function (only phase shifted). Over the interval from zero to π the two functions evaluate to the same value, hence the magnitude of the Action is always zero. There is quite a difference in the characteristic of law which says that a certain integral from one place to another is a minimum - which tells you something about the whole path - and of a law which says that as you go along, there is a force that makes it accelerate. The second way tells how you inch your way along the path, and the other is a grand statement about the whole path. In the case of light, we talked about the connection of these two. Now, I would like to explain why it is true that there are differential laws when there is a least action principle of this kind. The reason is the following: Consider the actual path in space and time. As before, let's take only one dimension, so we can plot the graph of x as a function of t. Along the true path, S is a minimum. Let's suppose that we have the true path and that it goes through some point a in space and time, and also through another nearby point b. Now if the entire integral from t1 to t2 is a minimum, it is also necessary that the integral along the little section from a to b is a minimum. It can't be that the part from a to b is a little bit more. Otherwise you could fiddle with just that piece of path and make the whole integral a little lower. So every subsection of the path must also be a minimum. And this is true no matter how short the subsection. Therefore, the principle that the whole path gives a minimum can be stated also by saying that an infinitisimal section of path also has a curve such that it has minimum action. Now if we take a short enough section of path - between two points a and b very close together - how the potential varies from one place to another far away is not the important thing, because you are staying almost in the same place over the whole little piece of the path. The only thing that you have to discuss is the first-order change in the potential. The answer can only depend on the derivative of the potential and not on the potential everywhere. So the statement about the gross property of the whole path becomes a statement of what happens for a short section of the path - a differential statement. And this differential statement only involves the derivatives of the potential, that is the force at a point. That's the qualitative explanation of the relation between the gross law and the differential law.